Yaletown Grand Prix 2008 « Vancouver Spotlight – Your Station! Your Stories! 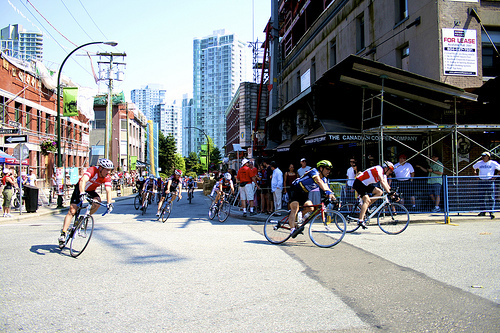 Heather Bissonnette takes us down to 2008’s Yaletown Grand Prix which took place on Canada Day. This is the 5th annal Grand Prix, the biggest event to date, with over 300 racers competing in over 6 events, not to mention the 20,000 plus spectators. Of the six categories, there are two women’s races: pro and amateur, and because there are still more men in bike racing, there are four men’s categories: two amateur, one for over thirty, and the professional category. With a new racetrack having been incorporated three years ago, the bikers describe the race as dodgeball on bikes, keeping them constantly on their toes with its pace. It’s one of the funnest races they do all year, with thousands of fans cheering them on around Yaletown, and with great support from the community. This entry was written by vanspotlight and posted on October 21, 2008 at 11:05 pm and filed under Family Activities, Outdoor Activities with tags amateur, bike, Canada Day, grand prix, pro, racing, riders, symmetrics, total restoration, yaletown, yaletown grand prix. Bookmark the permalink. Follow any comments here with the RSS feed for this post. Post a comment or leave a trackback: Trackback URL. Sorry I missed the event, it sounds good. I was in Whistler. I’m heading up there again at the end of the month for the winter ski season, hope to see you on the slopes.